What have we been doing since school officially finished for the year, you may ask? Or you might not ask, but I'm pretty much going to keep writing as if you did. First, we started with a tornado that came closer than any have in a long time. We were supposed to be out of the "real" danger area. The pictures of the dropping funnel cloud over our subdivision say otherwise. The staff at the National Weather Service office a few miles away had to take cover and transfer warning responsibility to another office. The tornado dropped and took nearly the exact same path we take to church and my mother's house. It was an EF3 tornado that traveled 33 miles from basically right past my house to past my Mom's. Talk about some anxiety. No damage to our homes, but many others we know have extensive damage. Waiting out the tornado. 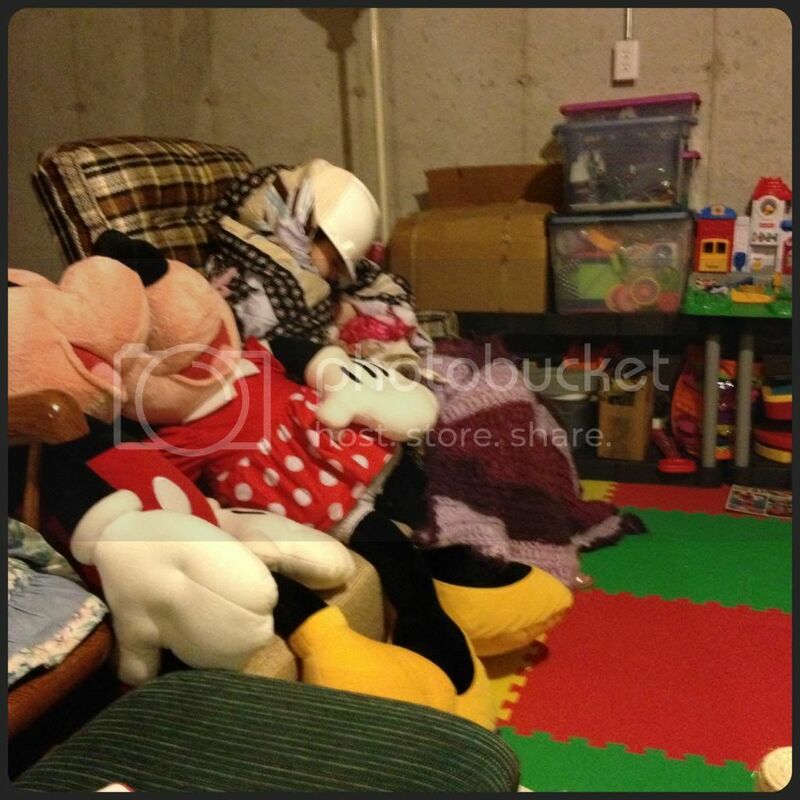 Can you find Amber? The next day was Amber's musical recital and my mom ended up spending the night afterwards since her area lost power for several days due to the tornado. Again thankfully, we did not even have that inconvenience. Amber and her musical theater class did well in their performance of "Consider Yourself" from Oliver. Amber played beautifully and received many compliments for her piano performance of "Angel of Music" from Phantom of the Opera. All in all, it was a great recital. Musical theater class posing after their performance. Amber and Mom at a post-recital dinner. Amber and I have spent quite a bit of time and energy trying out new gluten free recipes for common store bought items that are either ridiculously expensive, taste terrible, or both when made gluten free. We have found some fairly simple and yummy recipes for granola and granola bars. I never imaged the bars could be this easy to make. We have found the absolute best white bread recipe that creates a moist, but not soggy, flavorful bread. The texture is even "normal". Most importantly we found a recipe for Wheat Thins (actually, Sorghum/Teff Thins) which gives the real thing a run for its money. Amber is almost back to her regular self after being so sick for so many months. Clearly something we are doing has helped. I was feeling great too until an accidental gluttening a week ago, so now I'm recovering and being much more careful at restaurants. On that topic, we took Fred to Stoney River for his birthday this week and the staff there was superbly kind and helpful. They took excellent care of us all, ensuring there was no cross contamination or unknown gluten in Amber's or my food. Their attitude made all the difference. They made us feel they truly cared about our well being and were not simply following a company policy. It was our best gluten free experience so far. Chick-Fil-A has been great too, but occasionally they are a little lax and, honestly, their grilled chicken is about as appetizing as grilled rubber to me. I know, it's a cardinal sin to many people to criticize Chick-Fil-A, but besides the really nice workers I've not ever been impressed with them. 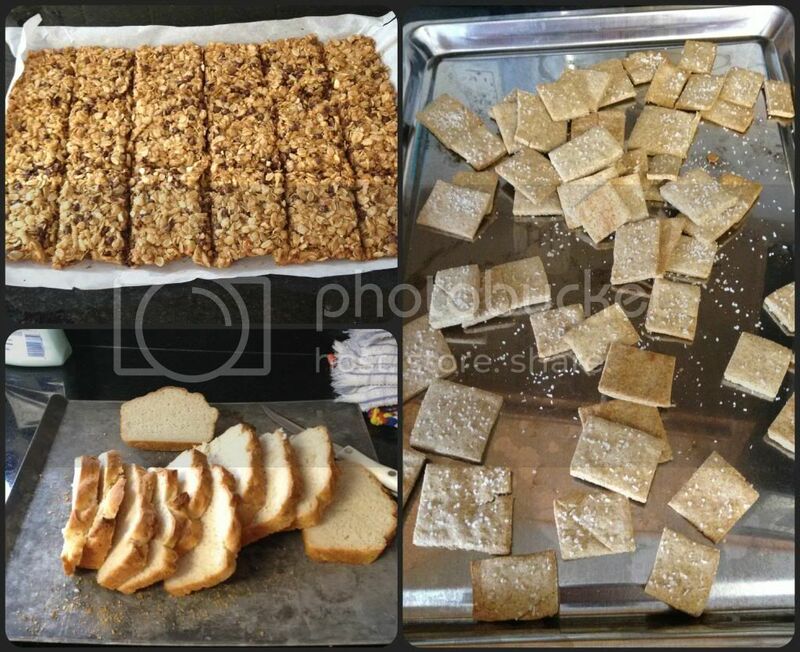 Homemade gluten free chocolate chip granola bars, white bread and "wheat thins". Yummy! 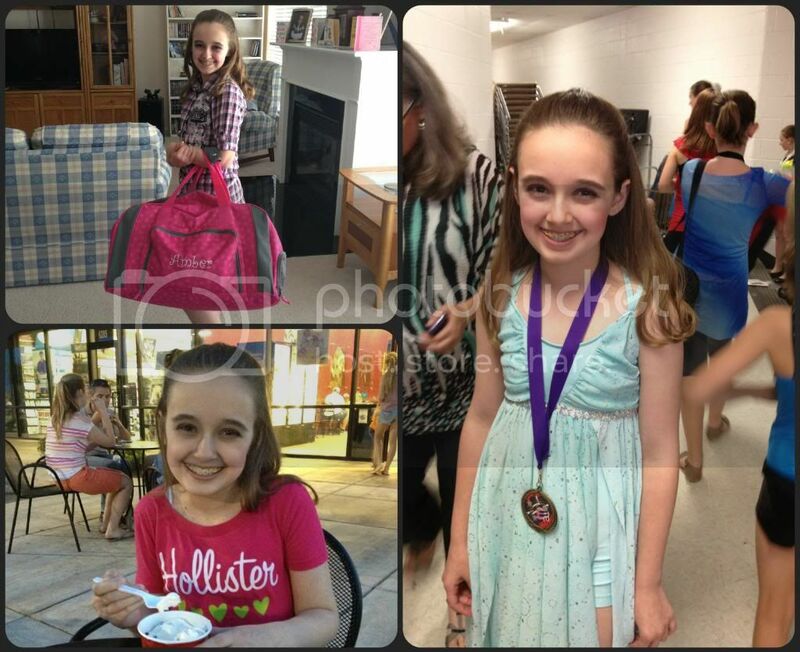 Dance recital finally came last Saturday, and it was one hectic day. Amber ended up performing 8 times in that recital, with a 9th costume change for the finale. Everyone danced their heart out making it a lovely afternoon of dance. I worked side stage and watched from there while Fred and my mom had prime seats. Still, I got to hug Amber after each performance and praise her and her friends. The lyrical class dance had a small glitch with the wrong cut of music, so after correcting the music, they performed again later in recital. The girls handled the surprise music well, and all made the same impromptu decision when the music abruptly ended. It made them feel better to eventually be able to perform their complete dance, even though it caused another rapid costume change. Ready for recital, with a new dance bag from my sister. Post-recital pose in her solo costume. It is all over, until December! Have I ever mentioned that Fred plays a game called WarHammer? It's fantasy battles with miniatures. I find it dull and tedious. He loves it and has played for most of his life. He is also a very talented artist and miniature painter. This is his hobby. Amber has recently taken to watching and painting a little with Daddy. She also wants to watch a game in play soon. Mostly, she just likes spending time with Daddy and "listening to him explain painting techniques". I think he may be her best art instructor yet. She certainly is producing much better results than with any other art teacher, and she enjoys it. This past week was Vacation Bible School at our church, and it was a very special year. This was Amber's last year as an attendee. She has graduated from VBS now and I'm not quite ready for that to have happened. I even got a little teary eyed at closing knowing she would never go again except as a helper. It was a benchmark that snuck up on me and then jumped out from nowhere reminding me how quickly time with our kids passes. Amber's last day of VBS! 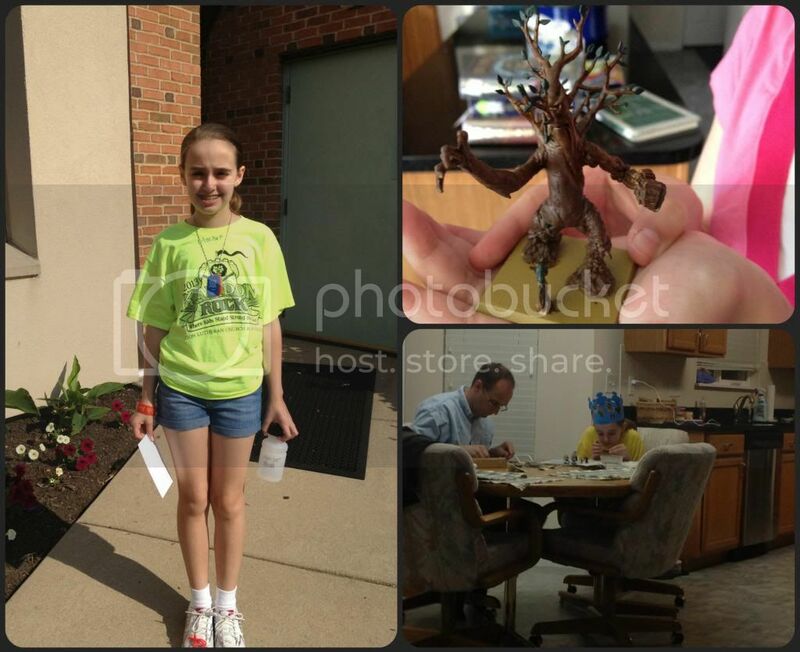 Fred and Amber painting miniatures together. Amber is STILL wearing the VBS crown. Amber did manage to complete the scheduled biology and Latin lessons the last couple of weeks, so our summer schedule is on track. We still are not loving or particularly liking biology, but it's not the curriculum at all. We both really dislike biology. I'm working on a way to scoot through biology quicker while not losing too much of the content. Along with actively planning 6th grade, and finishing up work on the old house that is still scheduled to close in less than a week now. So, you know, no pressure. As you might guess, the biology rescheduling isn't advancing terribly far. Look, Learning! 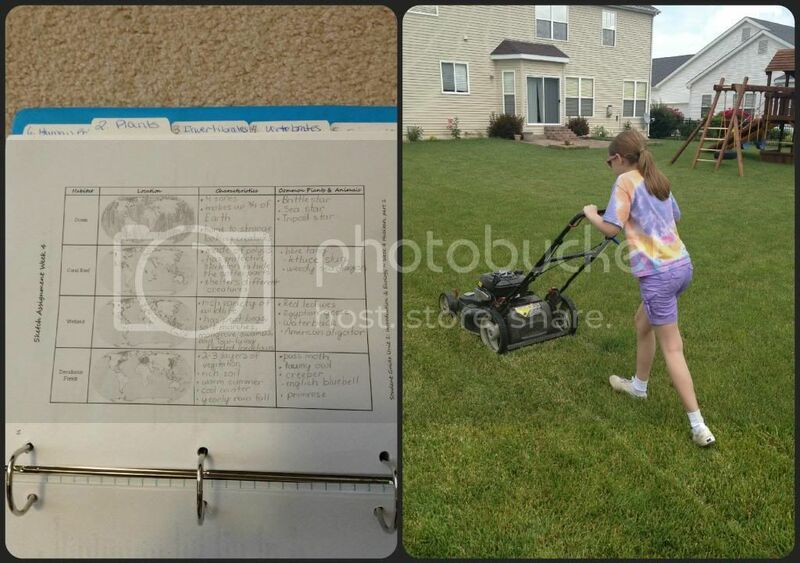 Amber's habitat sheet from biology, and her first time using a lawnmower. She didn't like either very much, but at least I have a yard helper now. I've also finally found a way to clean out our school shelves of the used and unneeded curriculum. I joined CurriculumShare.com and have managed to give away almost all of the items that were ready to depart. We have a few things that will go later in the year, but for now I'm thrilled. If you haven't been to the site before, check it out! It is a wonderful way to bless others and to find curriculum when you are on a tight budget. And just so you don't think it has been go-go-go every second, there has been plenty of summer reading and great progress has been made on the LEGO Lord of the Rings PS3 game. Amber even made us "comfy" spots on the couch especially for playing PS3. After finishing the story mode of the LEGO games, Amber mostly enjoys running around as favorite characters making up her own stories. We will eventually finish all aspects of the game, but her true enjoyment comes from total free-play. 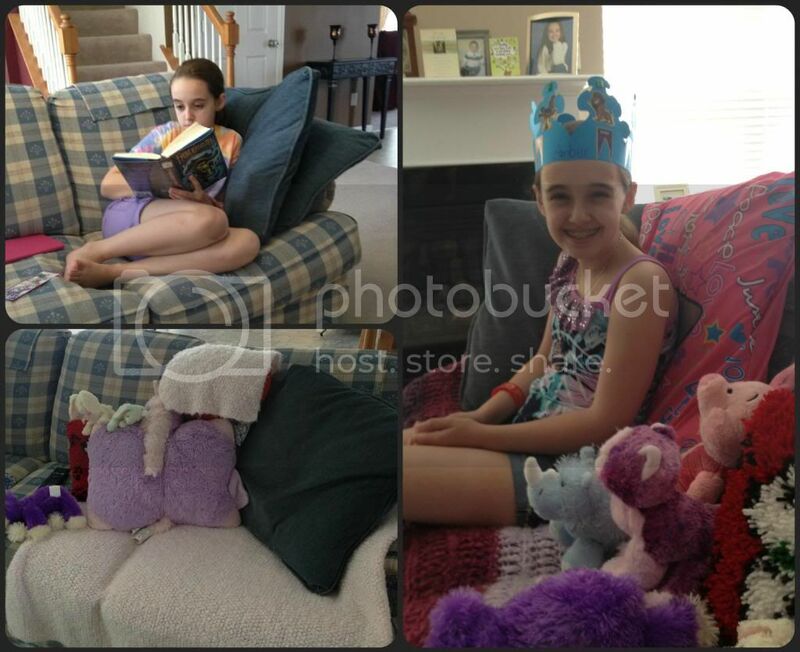 Summer Reading, comfy PS3 playing spots... of course, with the VBS crown too. Have you figured out yet that Amber loved that crown? 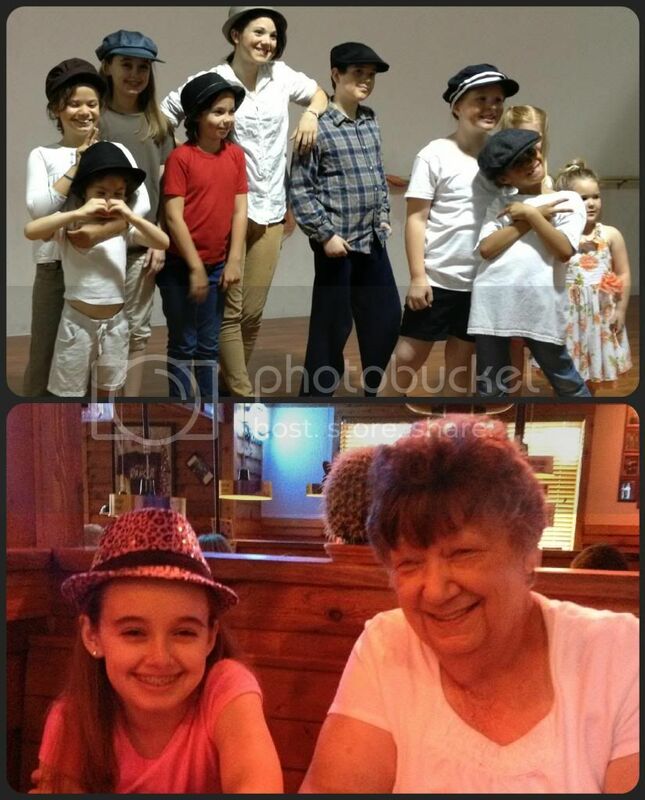 This coming week looks to be busy with more house stuff, more medical tests for Amber, and summer dance classes. At this rate, we will need to start school again just to get a break. I'm glad Amber is finally feeling better and that you're finding a few gluten free things that you like! I never was able to make a decent bread! I'd be nervous about a solo dance routine, too! In fact, I'd probably never even have the courage to try! I've never even been to a Chick-Fil-A! There's None around here! here's hoping and praying that feeling good lasts! I am glad that you were safe. It looks like you have been busy.